Cone Art Kiln Packages From Sheffield Pottery include Free Furniture Kit with Cone 11 Shelves, Free Complete Set of Replacement Elements, and Free Freight Including Residential and Lift-Gate Service*! *Free freight is curbside delivery to most locations in the contiguous 48 states. 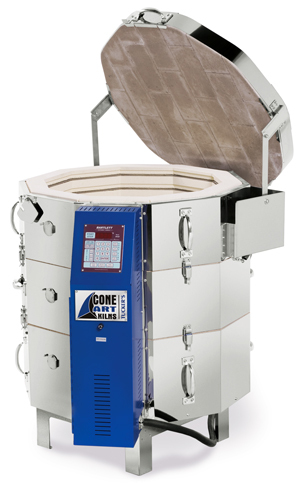 Cone Art Kilns are ideal for the production pottery/sculpture studio or classroom. The double wall construction makes them more energy efficient than any other top-loading kiln on the market. The extra insulation saves approximately 30% of energy costs compared to 2.5" wall kilns. The extra insulation also enables these kilns to fire to cone 10 temperatures everyday. Efficiency saves on wear and tear on your kiln so your relays last longer, your elements last longer so you save money year after year. You can expect incredible element life and minimal electrical consumption. These kilns are a perfect choice for cone 5/6 firing especially if you enjoy the wonderful effects of slow cool glaze effects! Cone Art Kilns feature a fantastic hinge system that spreads the weight over a wide area of the kiln instead of a single area in the back like most kilns. (see pictures) The hinges are off to the sides so the lid actually goes down behind the kiln. this makes it easy to open without going on tippy-toes : it almost opens across rather than up. It is nicely balanced so they do not need any lid lifters or spring assist. Coneart kilns have an angled box for the controller so it easy to see without having to bend over. This is a free upgrade from Coneart. All Coneart ceramics kilns include zone control. 18" kilns have 2 thermocouples and 22" and 27" have 3 thermocouples. These multiple heating zones ensure that the kiln fires evenly top to bottom every time regardless of your stacking. Cone Art has taken the element from the hottest part of the kiln (about 3/4 of the way up) and moved it to the coldest part of the kiln ( the floor). This is another feature which is no charge on Cone Art kilns and makes your firings extremely even top to bottom. Fitted with corrosion resistant stainless steel jackets and heavy-duty Kanthal A-1 elements, the Cone Art Kilns are durable and built to last. Cone Art kilns do not ship with a plug on their cord. They utilize a superior hard-wired connection. Standard 3 Zone on all 27"
Note: These kiln packages are an exact direct substitute for the Bailey Pottery kiln packages.